Vileda's UltraSpeed mopping system has proved its green credentials at Queen's University in Belfast. 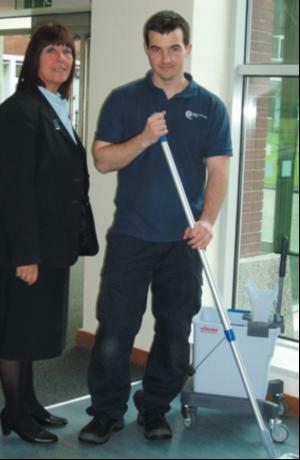 Cleaning the University is a huge task for estates manager Keith Halliday and his 75-strong team of domestics. "We're on a city centre campus with over 250 buildings of which nearly 100 are listed," says Halliday. "On a daily basis we clean 250,000 square metres." The university was also looking to improve its environmental credentials. "We'd already successfully introduced microfibre cloths some time ago, so it was a natural progression to move to microfibre mopping," continues Halliday. "We looked at the environmental cost of laundering mop heads, rather than replacing them.The results showed that laundering mop heads had far less impact on the environment and an overall cost saving too." UltraSpeed uses less water to cover the same area of floor space and a flat mopping system proved lighter and faster for the staff to use. Feedback on the trials also gave UltraSpeed the thumbs up for ease and diversity of use. One unique cloth. Twice the performance!